Russian Foreign Minister Lavrov, U.S. Staet Secretary John Kerry offer condolences on Nice terror attack. Russian Foreign Minister Sergey Lavrov and U.S. Secretary of State John Kerry have visited the French Embassy in Moscow to express condolences on the terrorist attack in Nice, a TASS correspondent reported from the scene. The two top diplomats laid flowers at the embassy wall in memory of the victims. 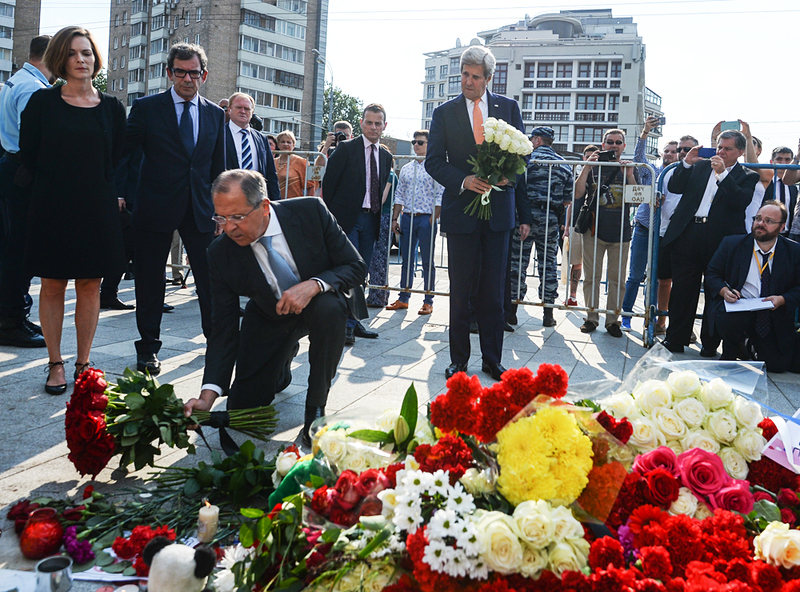 Kerry laid white roses at the improvised memorial, and Lavrov - red ones. To express condolences Lavrov and Kerry interrupted the talks that began at 10 a.m. Moscow Time. Meanwhile, Muscovites and guests of the Russian capital have been laying flowers at the entrances to the French Embassy in Moscow. A book of condolences has been opened in the diplomatic mission for those willing to express solidarity with the victims of the terrorist attack. There were thousands of people at the moment of the attack on July 14 evening on Nice’s Promenade des Anglais, who were leaving a festive firework display commemorating Bastille Day. A truck rammed into the crowd at full speed. According to the latest reports, 84 people have been killed, about 70 others were wounded, 18 of them are in critical condition.